The Bird is awesome! It’s so easy to use and can be used for so many reasons. The mirror mode came in handy while on a trip this winter. We had a car in front of us with chunks of ice flying off their hood towards us and we were able to politely let them know what was happening. Also love using this at a get together. I brought it to my grandfathers birthday party with preprogrammed messages that played throughout the night. So fun! Two thumbs up for The Bird!!! The limit only ends with your imagination. Awesome product. Great product and very easy to use. I use the Android app and it pairs almost instantly and stays paired up to 100 feet away (it may be more, but that’s as far as I tried). I tend to use it as much at my desk at work as I do in the car. I leave a scrolling message when I am away from my desk or on vacation. The variable brightness helps with indoor applications as the LED’s are super bright at full power. On AA battery power the batteries last an incredible amount of time. No problems with it so far. 5 stars. This thing does more than I need it to. I mainly got this for Uber/Lyft because I work night shifts and passengers have a hard time finding me. This helped so much even during the day time! The passengers love it and think it’s cool to see their name on there when I pick them up. It’s super easy to use and set up using my iPhone 7 Plus. Also, being able to put emojis on there makes it that much better! Love this product! I highly recommend it for business or personal use. great product.. super fast delivery..customer service is on top of their game..made sure i had everything before delivery…super quick to Hawaii..
Amazing Product! Very easy to setup! I am actually using it for a completely different operation; in a restaurant! It’s allowing my Door staff alert the Bar team on which Bar seat number to close out before the guest get seated, without wasting time looking for the guest and informing them and without interrupting the bartenders on a busy night. If you’ve been looking for an incredibly versatile portable Bluetooth LED sign, meet The Bird. Coupled with The Bird app, a free download from the Apple App and Google Play stores, and you own the most useful AND fun LED messaging solution on the market. It’s small enough to carry with you, but big enough to read from nearly 100 feet away.The Bird speaks English, habla español, parle français, spricht deutsch, parla italiano, spreekt nederlands, fala portugues… you get the idea. 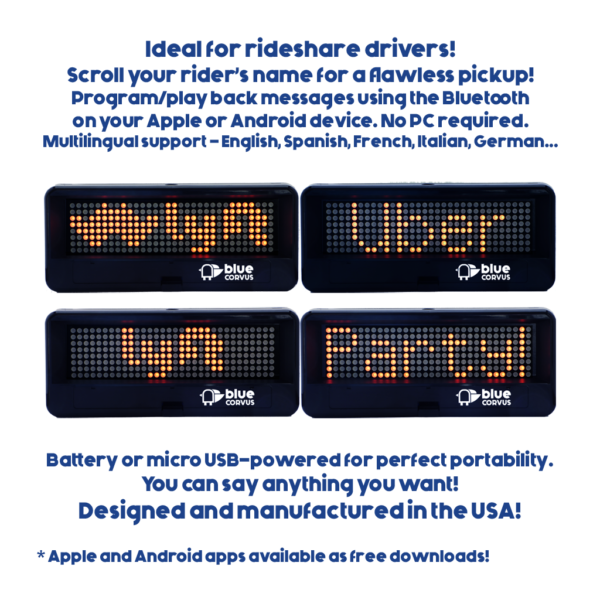 Rideshare (Uber/Lyft/limo) drivers – make that pickup happen confusion-free and delight your client by displaying THEIR name! Storefront window – why not say more than just “OPEN”? Scroll your business’ specials! Hometown sporting events – yeah, you can be the one that lets everyone know the score! Office desk – let your coworkers see your happy thought of the day. How will YOU use YOUR Bird? Use your device’s built-in keyboard, or for even faster message entry, utilize the voice-to-text! 16 levels of brightness – from “It won’t wake the baby” to retinal-searing. Readable up to 90 feet in bright sunlight. Mirror mode – allows the driver in the car in front of you to read your front-facing message in their rearview mirror. Love the idea of The Bird, and you want it to be rechargeable? Done! The Bird Rechargeable includes ALL of the features of The Bird* and adds a rechargeable 1050 mAh Li-ion battery. To sweeten the deal, the battery is an industry-standard 14650, and it is user-replaceable. The Bird Rechargeable will run anywhere from 1.3 hours to 11.5 hours total per charge, depending on your brightness setting. To charge the battery, just plug your Bird Rechargeable into the Blue Corvus Vehicle Power Kit, and you’re set – 2.5 hours to a full battery. And, you can charge your Bird and power it through the micro USB port simultaneously, much like a mobile phone. * The rechargeable battery replaces the standard Bird’s option of using AA batteries. Psst! 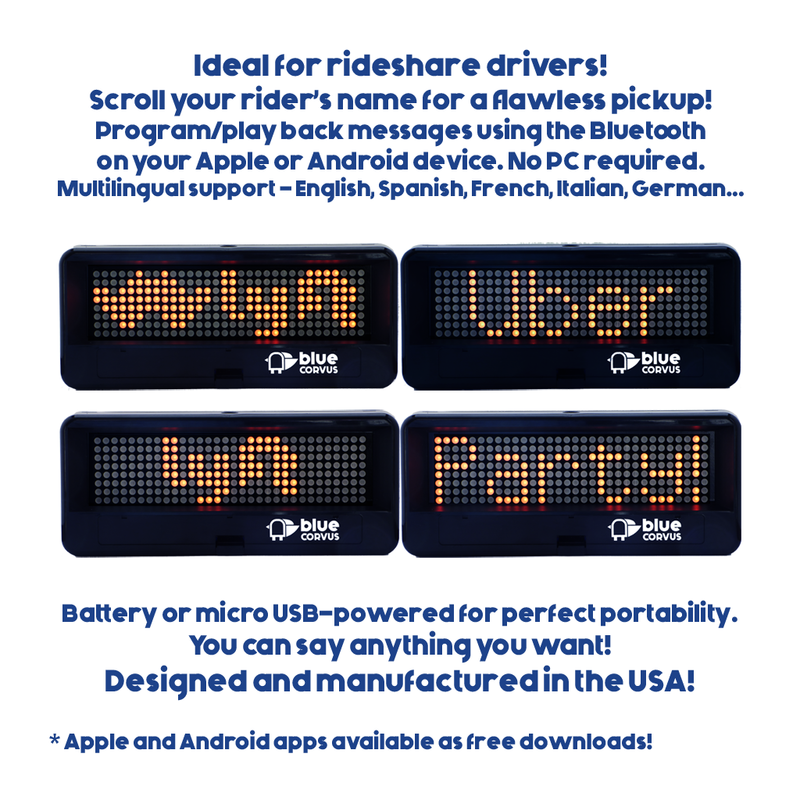 Uber/Lyft/Limo/Rideshare drivers! You love The Bird, but you’re thinking you want to wade into the programmable LED sign game and keep an extra Andrew Jackson in your wallet? Check out Blue Corvus’ latest release: baby Bird! It includes most of the fantastic features of The Bird and is the PERFECT value solution for getting your rider to find you FAST! Powered by either 3 AA batteries or via the micro USB power port. Text input straight from your phone or tablet’s keyboard! Running the baby Bird app on your Android or Apple phone or tablet, quickly input and program your messages. “Banner Mode” allows you to scroll and freeze your message or text logo! Bluetooth Low Energy for fast and effortless wireless programming and control. Readable up to 75 feet in bright sunlight using baby Bird’s visor. Suction cup mount with standard 1/4-20 threads and sun visor included. baby Bird will run anywhere from 7.8 hours to 100 hours on a fresh set of good-quality alkaline batteries, depending on your brightness setting. If you want to skip the “battery anxiety”, plug your baby Bird into the Blue Corvus Vehicle Power Kit, and you’re set – endless power! If you have batteries installed, baby Bird automatically knows to use the Vehicle Power Kit for its juice, as long as it’s plugged in. Once you unplug baby Bird from the VPK, it automatically switches back to battery power. Nice! The Quick Release Mount has two different attachment orientations and is used in conjunction with the included suction cup mount to provide fast mounting and release of your Bird from any smooth surface. 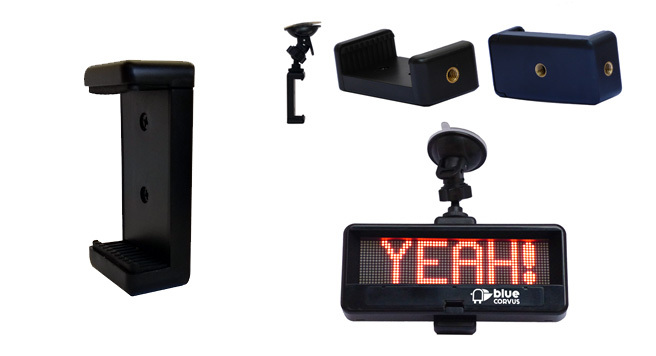 The Vehicle Power Kit is for the users who want their Birds to display messages continuously. Plugs into your cigarette lighter adapter and includes a 9.8-foot USB cable to provide plug-in power for the longest of vehicles. The Vehicle Power Kit is for the user who wants their Bird to display messages continuously. 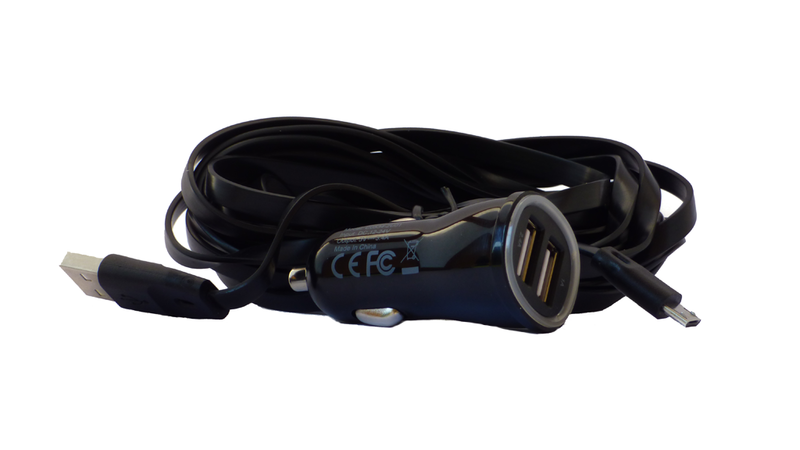 Plugs into your cigarette lighter adapter and includes a 9.8-foot USB cable to provide plug-in power for the longest of vehicles.